Recently compiled data from the United Methodist Church’s General Council and Finance and Administration (GCFA) shows a significant shift in where the concentration of membership is moving globally as well as within the United States. Compiling membership data for a denomination is always a moving target. Some areas assemble their data faster than others, and then it takes some time for a centralized office like GCFA to receive, review, and officially certify everything. Recent reporting on Juicy Ecumenism has generally used the GCFA’s figures for the clergy and lay membership of each United Methodist region around the globe in 2012. It was on the basis of these statistics that varying numbers of delegates were allotted to each annual conference for the 2016 General Conference. The final U.S. statistics for 2015 were just released this month. At this point, the latest comprehensive set of such statistics for the denomination’s overseas central conferences was for the year 2013. There are obviously limitations to such data. But the actual counts of clergy and lay membership are the clearest hard data for measuring how many people our denomination has in each area. 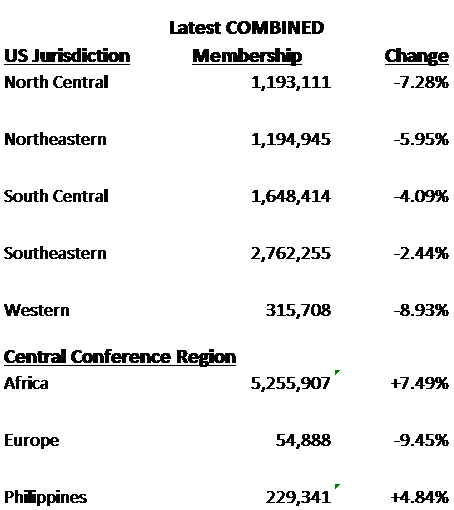 What follows is a chart showing the latest combined clergy and lay membership figures for each of the five U.S. jurisdictions and three central conference regions (Europe and Africa each have three distinct central conferences, while there is only one in the Philippines) and how much of a shift in numbers this represents from the 2012 statistics. Figures are based on 2015 statistics for the USA and the 2013 statistics for elsewhere. In the big picture, we continue to see membership losses in the United States and Europe offset by greater gains in Sub-Saharan Africa. There is also some notable growth in the Philippines. However, it is not enough to simply note that we are losing members in the United States. Trends of decline, and growth, are very uneven within America. Once again, the latest data shows that the Western Jurisdiction, whose leadership’s aggressive theological liberalism and open defiance of our denomination’s communal covenant are well known, continues to be the fastest-shrinking U.S. region of the denomination. Evidently the secularized theology, cultural pandering, and rhetoric about “inclusiveness” combined with the ways in which the Western Jurisdiction bishops have mistreated and in some cases driven out faithful evangelical pastors aren’t working out very well. On the other hand, while losing “only” 2.4 percent of your people in three years is nothing to be proud of, it is no coincidence that the Southeastern Jurisdiction is both the most evangelical-leaning of the five and the one whose membership decline is not nearly as steep as any of the others. The other three jurisdictions’ theologies and decline rates are somewhere in the middle, with the relatively more liberal northern jurisdictions declining at faster rates than the relatively more traditionalist South Central Jurisdiction. The actual decline of the Northeastern Jurisdiction may be even greater than these numbers suggest. But at that region’s 2012 Jurisdictional Conference, one presenter brazenly urged leaders to avoid cleaning long-inactive members from the rolls of congregations, for the express purpose of gaming the system by allowing the Northeastern Jurisdiction to claim enough nominal members to justify it having nine rather than eight bishops. As you can see, the chart below lists U.S. annual conferences in order of their rate of decline from 2012-2015. The higher an annual conference is on the list, the greater its rate of membership decline, relative to other areas. To help us visualize the dividing line between those annual conferences that are above average in this area from those that are below average, I have put the statistics for American United Methodism in the proper place in the middle. I noted who the bishop was for each annual conference during this period (which changed for many conferences two months ago). Our bishops obviously bear great responsibility, and the greater an annual conference’s rate of decline, the more its bishop really had a duty to make publicly clear that the church could no longer be run as it had been, implement a major course correction, hitting the panic button as much as necessary. But it is not fair to put all of the blame, or credit, on our bishops. Annual conferences consisting of dozens or hundreds of congregations spread over large areas are very complex entities. Bishops are often significantly more theologically liberal or conservative than the annual conferences to which they are assigned. And as with local congregations, there are sometimes situations in which growth happens in an annual conference in spite of the poor leadership of a bishop, or where decline happens in spite of a bishop’s fervent efforts to reorient the conference towards renewed evangelistic passion. Given the complexity and vast size of our denomination, there will be numerous local exceptions to any broad generalizations about such data. Yet a few big-picture observations are in order. The (eastern) North Carolina Conference’s growth of less than half of one percent is not exactly impressive – except for the fact that it stands alone as the only one of 57 U.S. annual conferences to have experienced any net growth in the last three years on record. The Texas, Tennessee, Kentucky, and North Georgia Conferences get honorable mentions for holding about even with less than one percent membership decline. Looking at those few episcopal areas that have the rare combination of being relatively theologically traditionalist at the grassroots level and having a bishop during this period who was one of the more outspokenly theologically orthodox bishops, they are concentrated near the bottom of this list, meaning they are doing better than most other conferences in terms of membership trends. Of the nine annual conference’s whose rates of decline hit the double digits (i.e., they lost more than 10 percent of their people in just three years), all can be fairly characterized as being among our denomination’s more theologically liberal annual conferences, with the exception of West Ohio, which is more mixed. It is really striking that half of the Western Jurisdiction’s eight annual conferences are in this group of fastest-declining conferences. Thus, even amidst a context of overall decline within the United States, we are seeing the clergy and lay membership, and consequent influence within denominational affairs, shift away from many of the most radicalized areas of our denomination, so that more traditionalist areas should become increasingly dominant. With these latest statistics, we see that African United Methodism has surged well past the 40 percent mark of denominational membership as it continues its march toward making us a majority-African denomination. Already, the three African central conferences plus the U.S. Southeastern Jurisdiction constitute over 63 percent of the church, and this super-majority may shift to two-thirds within just the next couple of years. If you have any insights for key factors in driving the growth or decline rates in any of the above-mentioned regions in particular, please feel free to share in the comments! UPDATE: I have recently learned that much of the recent decline in the Central Texas Conference can likely be attributed to a major effort a couple of years ago to clean up the membership rolls of congregations in that conference. Looking at the declines and distribution it is clear the majority of UMC bishops are either in league with the devil or simply don’t believe the gospel. May God have mercy. Just in our church alone we’ve lost members since our AC voted to ignore the discipline in the WJD, DSAC. The Bishop and DS visiting our church to talk about it didn’t help–in fact made several angry and they left. There may be more leaving yet. until the UMC goes back to the discipline and embraces the guidance found in the Bible…the fall will continue. Hopefully the Wesleyan Covenant will help some of us remain in the Wesleyan tradition…otherwise, I and many more in the NC Conference will also abandon the UMC. Question: As interesting it is to assume that “the liberals” are declining because of their theology, these numbers really don’t say that. There is no way to claim that the numbers support that specific thesis. There might be a correlation, but that is all. For instance, we wouldn’t expect an evangelical church to grow in a so-called liberal region, would we? Thanks for the comment. I was careful in my wording. Many evangelical churches are able to grow in very culturally liberal regions. Plenty of prominent examples outside of UMC. But too often, our bishops choose to avoid sending evangelical pastors into urban areas. Could you give a link to this data? But the rest is taken from emails directly sent to me from GCFA staff in response to my inquiries. I find it ridiculous that we celebrate small negative growth. Look at Florida(~-10%) and it is one of the fastest growing states. You might argue that a large chunk of the population growth is Hispanic. Yeah, it is and they are becoming Seven Day Adventists. It is a fact that the religious beliefs and practices that the enlightened among us call “quaint” and “antiquated” are indeed the churches with the positive growth. It would be interesting to know if those who leave are joining other churches or not, and if there was a reason given or known for WHY they left. The hoped for return of accountability in moral values should have those numbers improving even in the U.S. Things should begin to turn around in the spring. That’s when New Life springs forth in nature and with a little luck, also in our administrative system. UMC are loosing members the Local churches have return so munch money to the conference. My mother got a $9,000 death benefit. When Dan died in 1983 she got insurance plus a nice person for almost 30 years. No corporation would give a death benefit for her kids. B W conference hold annual conferance high cost area’s like Balitmore Inter Habor. Retired minister can afford to go anymore. Members are finding Indepentant Churches were they don’t have to support 18,000,000 dollar Conf. Budget. The Church rejected my email because I didn’t have a web I put a lot of effort in it so you erase it. The UMC Does’t really want my in put. That another reason you are loosing members. As someone raised in UMC and now a very inactive member due to the stance that was today driven home, I really think you’re on the wrong side of history. Even my grandmother who jokes she is the youngest member of her UMC congregation in Florida posts on Facebook about the very affirming LGBT messages she gets in her congregation.